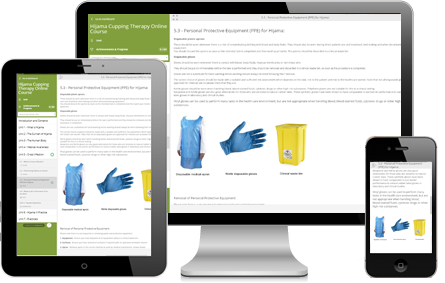 We believe we have built one of the worlds most user-friendly online Hijama courses. A step by step system that you can work through at your own pace. Our course is one of the most well known internationally. Therapists have studied with us from Belgium, Finland, Italy, Kosovo, Sweden, Switzerland, Canada, United States, Maldives, Philippines, Kuwait, Oman, Saudi Arabia, Kenya and Australia. Click here to see our full list of therapists worldwide. Our online course contains the same syllabus as the 1 day course we teach. This course aims to be as concise as possible. We believe it can be completed within a week. But the course can be worked through at your own pace. The course is compatible with mobile devices such as iPads and iPhones, for better convenience whilst studying. Questionnaires for each module, downloadable in MS Word format and to be completed in your own time. In order to gain the certification, you will be required to provide a video of yourself performing Hijama. Having the correct equipment is necessary to do this. So you will need a cupping kit and medical gloves. We will send you a full list of needed equipment beforehand. What are the best days for Hijama? Are there any duas to be recited before Hijama? ​How much blood can be taken during Hijama? - You must be over 18 years of age to be eligible for this course. - You must also have a good understanding of English. - You must also have access to YouTube and Vimeo video websites from your country. - A good internet connection is also required. You can enrol anytime. Please ensure you send us the following details, in your email: Full name, Age, Male/Female, Address and Phone number. Can I really learn Hijama online? Yes Hijama is simple, it has been practised by many cultures through the centuries. However there are certain health, safety and medical standards which need to be observed by law and practioners must be aware of. The practicals will ideally be conducted via Skype. There is also the option of recording and uploading your practicals to a free video website for review. Is the course mobile compatible? Yes. Our course allows you to study from the comfort of your sofa using your mobile device. Your progress is tracked from screen to screen allowing you to easily resume anytime. Yes we have many people who have completed the Hijama Clinic 1 day course in the classroom, who have gone on to set up their own practices. You may contact them to ask about their experiences on our course. Please take a look at our therapists page to see a list. Please use the following options to secure your place on the Hijama Online Certification Course. Alternatively you can pay via paypal, using the button below. Please enter £495 as the payment amount.